Marvel's Super Hero Squad Online is an upcoming MMO for kids, featuring cutesy versions of Marvel characters. At New York Comic-Con, the people behind the game wanted to surprise us, but showing us some of Marvel's nastiest. Any and every Marvel character can be in this game, one of the game's developers told an audience attending a panel about games based on the comic company's icons. 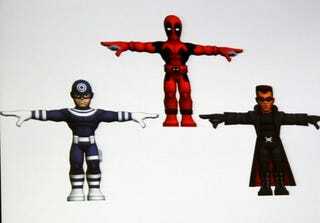 Bullseye, Deadpool, Blade.... those guys in the slide above will be in there. So will the guys and gals in the slides below. We haven't seen much of the game in action yet, but the character designs here are neat. You can see the official roster for the game at the game's site (you can also sign up for the beta there), but expect an expanding line-up. Even Squirrel Girl might make it in, one of the developers said at Comic-Con, addressing shouted requests from a panel audience. Looks like they'll put anyone in this game!